We can provide school displays tailored to suit your specific requirements either for general education, or for Latin, Classics and History students. Reading passive books or viewing film is all very good, but a live performance, where the students can handle the equipment and even participate in roles, will fire their imagination and leave them enthralled for the subject. Our performers include a Roman centurion and a Roman matron with a passion for ancient history who are qualified with degrees including MA in Ancient History, Classics, Latin & Archaeology. The children learn a lot while having great fun, and we have received fantastic feedback and appreciation from the schools for our shows. Please contact us to discuss your requirements. A donative to the club applies. 1. 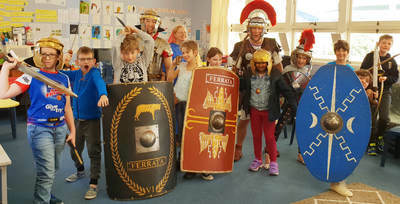 A 90 minute program that includes introduction to the Roman Army, hands-on activities including writing on wax-tablets, making flour from grain on the wheat-grinding-wheel, minting your own real Roman coin to keep, Roman music & dance, and a gladiator demonstration with audience participation. 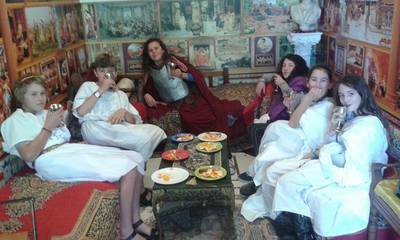 Please view our 90 minute school Roman experience and activities here. Roman musical instruments - we are developing an extensive collection of unique ancient instruments for children to try hands-on and participate together in playing ancient music and dance. 2. At St Cuthbert's School we divided about 60 students into four groups of 15 that participated in Sword training on the pell, Firing the scorpion ballista at the dummy target, Roman shield drill formations, and Archery & pilum practice against vallum. Please view these activities here. 3. 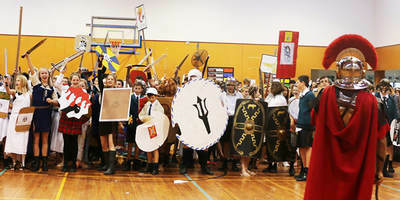 At Kristin School we led 160 students who made their own cardboard shields and swords in group formations and demonstrations. Please view these activities here. 4. 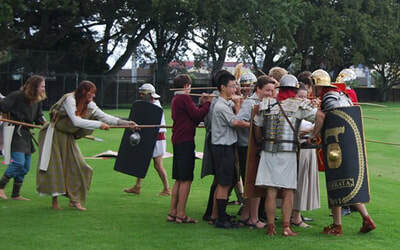 At King's School a large performance demonstrating Roman army against Greek phalanx, gladiator fights, and audience participation in an historical narrative. Please view these activities here. 5. 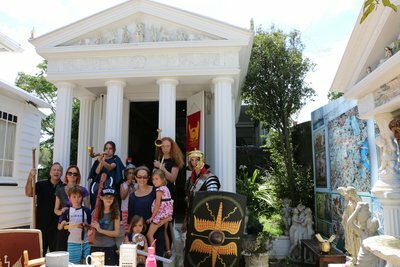 We also entertain small groups at our Roman temple in Grafton by arrangement, and let the kids try out a variety of Roman gear. Please view the Helensville home school visit here, and the Puhoi home school visit here. 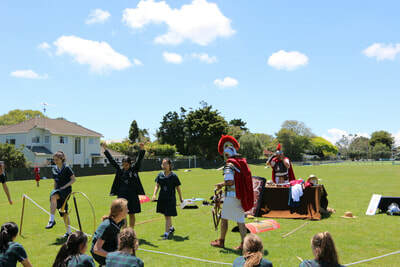 For a school visit please email our Club Captain Brett Clark at brutus@imperium-romana.org or phone 0211193216.